Stars from the East and the West flocked to Singapore to celebrate the reopening of HUGO BOSS' newly designed flagship store in Marina Bay Sands.The grand two-day affair hosted influential personalities from the worlds of fashion, entertainment, and business, who were all eager to catch a glimpse of the new boutique and the fashion collections, as well as mingle with internationally-renowned celebrities. A highlight of the first day was the Q&A with Singapore's Olympic gold medalist Joseph Schooling and actor Sebastian Stan, who are both brand ambassadors. 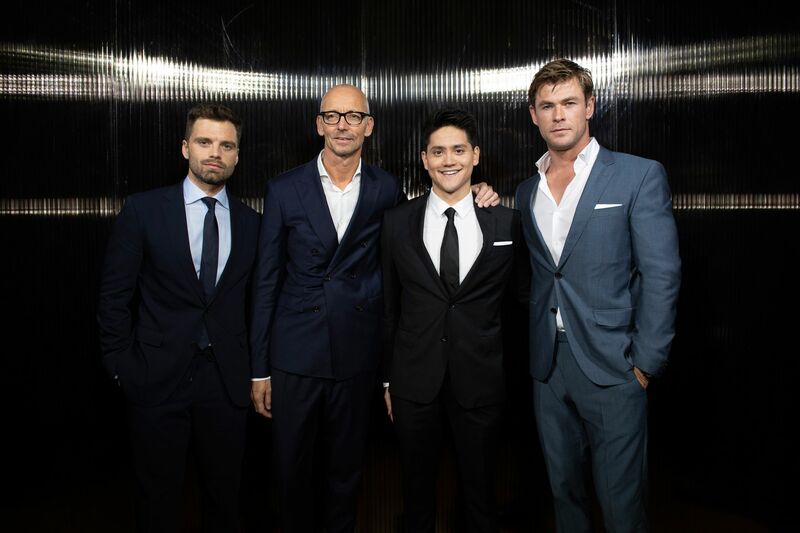 The second day saw Thor actor Chris Hemsworth joining Stan at the front row of the BOSS Menswear and Womenswear fashion show presenting the Fall/Winter 2018 collection. Also at the scene were Nico Bolzico and Solenn Heussaff, Marion Caunter, Tan Chuando, Fiona Fussi, and JC Chee, who are all decked out in the label's latest tailored yet playful pieces. On the runway were model Park Soo Joo and Schooling who led the finale of the show. The Fall/Winter 2018 collection fuses BOSS' iconic tailoring with sportswear. This unique take on the athleisure trend can be seen in the all new silhouettes and juxtaposing combinations. Some notable elements are oversize tops set alongside subtly cropped and tapered trousers, drawstring waists and ribbed cuffs on neatly tailored pants, and sharp pinstripes along garments. The BOSS signature, double-breasted tailoring, appears in the form of long cashmere greatcoats in soft, structured wool, while tailored jackets in stretch-nylon lend a new touch to the brand’s iconic suiting. Meanwhile, the color palette stays classically sartorial n shades of gray, blue, and brown, but highlighted with bold yellow for sportswear flair. In the Philippines, BOSS is exclusively distributed by Stores Specialists, Inc., and is located at City of Dreams, Greenbelt 5, Shangri-la East Wing, Rustan’s Shangri-la, Rustan’s Cebu, and 158 Designer’s Blvd. Newport Mall. Visit www.hugoboss.com or follow @ssilifeph on Instagram for more information.